What kind of printing press would we be without printing presses? We have five or so different presses living in harmony together in our pressroom. 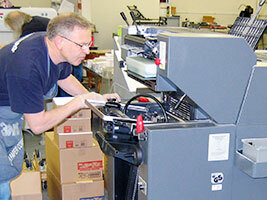 We have a full-color press, two-color press, one-color presses, presses for envelopes, presses for large-format printing, presses for die-cutting and scoring, and even a few Windmill presses for letterpress work. And, better yet, Record Printing has the right people to run this equipment.